Valerie Jablow has yet another well-researched column on how the laws on accountability and transparency are NOT enforced in the education sphere in DC, especially for charter schools. I highly recommend reading and digesting it, and then figuring out how to act on her recommendations. The Corporate Educational Deformers (or GERM) now have a record by which they can and should be judged; after all, they have been severely criticizing the regular public schools for all sorts of failings that they promised to fix by, among other things, establishing charter schools that would perform miracles with all the students that the regular public schools were supposedly giving up on and ignoring. Two of those ills are: students dropping out, and not good enough test scores — particularly among poor students in general of all ethnicities and minority students in particular. How are the charter schools doing? 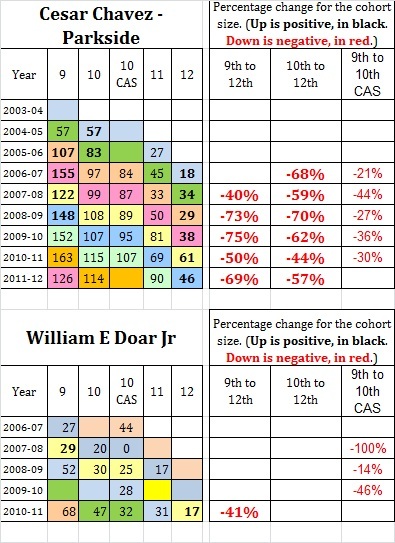 Erich Martel, a veteran DCPS social studies teacher who has been a persistent and eloquent critic for many years of the errors and abuses perpetrated by the administrators of DCPS, now has prepared a number of charts that show how many students are in each of the charter schools’ grade levels over time. 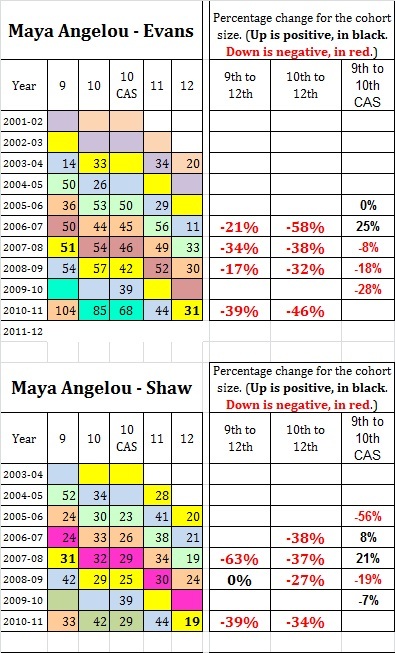 I modified the formatting a little bit and made Excel calculate the percentages of growth or decline for each cohort as they approached their senior year of high school. I hope he will forgive any errors I made. Erich has kindly colored the cells so that you can follow each cohort of students as they move from 9th grade through 10th, 11th, and eventually on to 12th grade. But by 12th grade, that cohort had shrunk all the way down to 11 students. How and why? I can only guess. But that is an enormous shrinkage from either 10th or 11th grade. 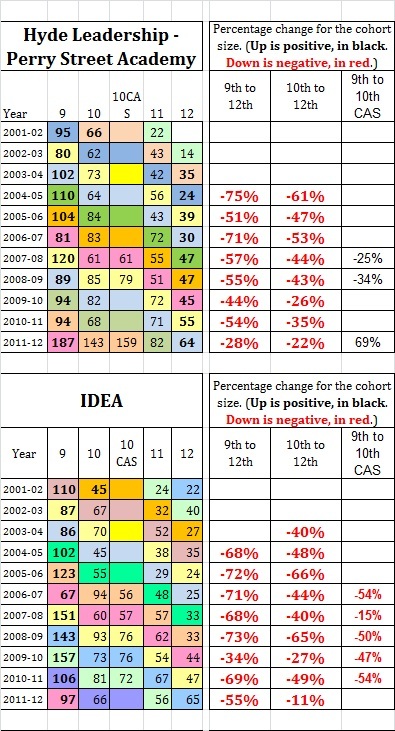 The next cohort, in green, went from 50 freshmen in grade 9 in 2004/5, to 53 sophomores (grade 10) in 2005/6, but only 50 are listed as taking the 10th grade DC-CAS; that’s what column “10 CAS” means. 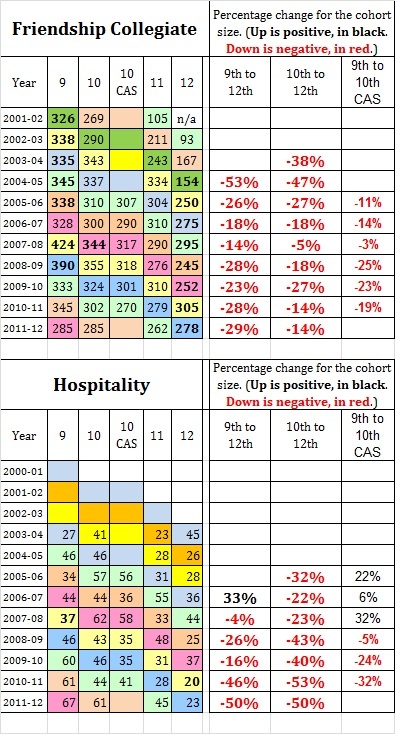 By 11th grade, their numbers increased to 56 students, but in the 12th grade during SY 2007/8, they lost 23 students and shrunk to merely 33 seniors. However, the data people downtown in DCPS and OSSE do have that information available, easily, since they can track each and every single student via standard computer database queries using the DCPS student information numbers; but so far they choose not to reveal it. I suspect that some data experts would love nothing more to reveal secrets like that but are under strict orders not to. 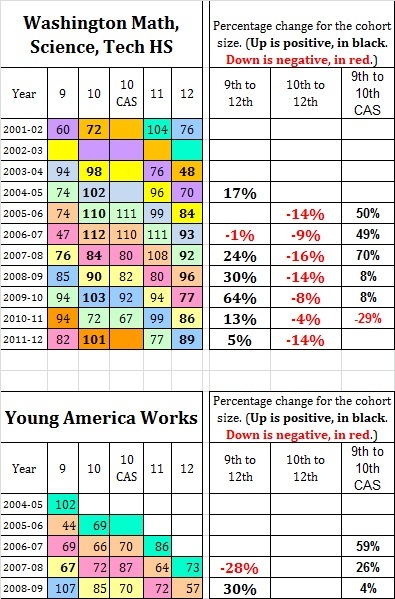 The last three columns in these charts show how the number of students changes from 9th grade to 12th grade and then from the 10th grade to the 12th grade, or from incoming 9th graders to those taking the DC-CAS as sophomores the next year. If you want to make any other comparisons, feel free to get out a calculator and do it yourself. 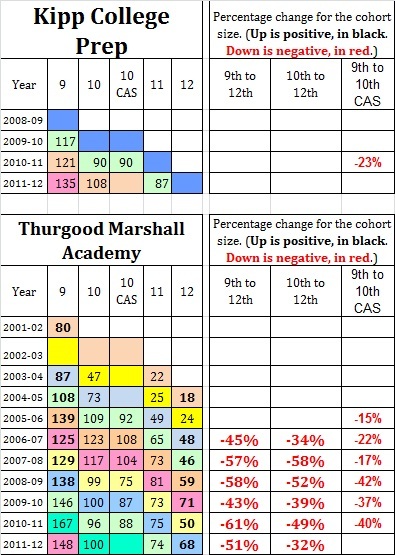 In those last three columns, percentages shown in black letters mean that the student body actually grew from freshman (or sophomore) year through the senior year, 12th grade. Red lettering means it fell, i.e. students dropped out of this particular cohort in this particular school in one way or another. So for the blue cohort at Angelou Evans, the class that was to graduate in 2007, their numbers overall went from 14 freshmen to 11 seniors, a drop of 3 kids; 3 divided by 14 by calculator gives 0.2142857…, which we rounded off to NEGATIVE 21%, which is indicated in red and with a minus sign. That same cohort went from 26 sophomores to 11 seniors, a drop of 15 kids. A loss of 15 students, compared with a starting number of 26 students, by division, yields a loss of about 58%. Not so good. And so on for all the other cohorts at that school and at all the other DC privately-run “public” charter schools. In many cases, Martel simply doesn’t have any numbers. That can be for a variety of reasons. In those cases, I did not calculate a percentage of growth or shrinkage, because I simply don’t know the facts. 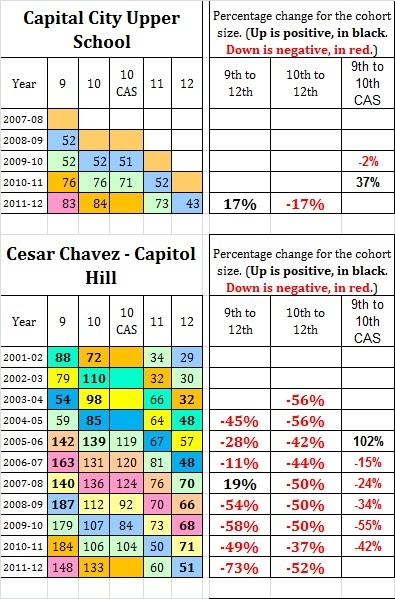 The myth is that DC charter schools are NOT experiencing dropouts over the high school years. Unfortunately, this is not the case. If the last two columns were all black, that would show that HS students are flocking to the charter schools in significant numbers and are in general, not dropping out (or being forced out). Lots of red is a very, very bad sign. 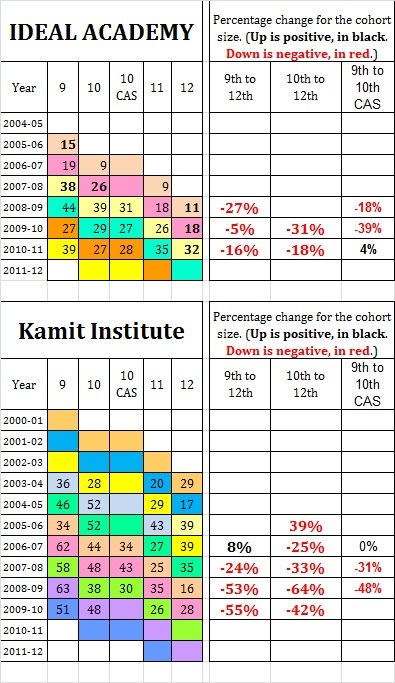 However, the vast majority of the last three columns are printed in RED, meaning that enrollment of the vast number of cohorts declined, according to this data. So where exactly are these miracles about solving the drop-out rate taking place in these supposedly miracle-working charter schools? I only see two charter schools, out of the entire lot, that have a significant number of percentages printed in BLACK, showing cohort growths over time: Washington Math-Science .Tech Academy and the Booker T. Washington charter schools. The rest are either in RED, or are blank because numbers are not being released. Let me add that I am very impressed with Martel’s data. I’ve been looking for stuff like this for quite some time!